Make sure that the General settings tab is selected at the top. 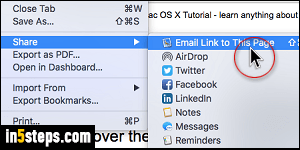 Now click on the Default email reader dropdown menu: Mac OS X will list all the recognized email apps currently installed on your computer. Pick the one you want to use as the default. 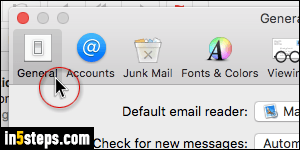 If it's not in the list, click on the "Select..." option at the bottom to manually pick another app from the Applications folder. 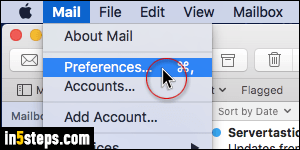 Your setting is automatically saved when you close that Preferences window. 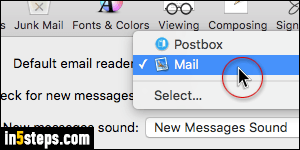 To test that the default email program is the one you wanted, open any web page in Safari and hit Command+Shift+i to email a link to that page. 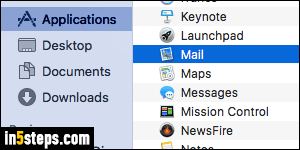 Safari will open new, blank email with a link using your new default mail application!